You are currently browsing articles tagged ORY. The fastest way from Orly Airport to Paris is by train. The Orly Airport train (OrlyVal) departs from both Orly Terminal West (Orly Ouest) and Orly Terminal South (Orly Sud) . … in that order, from South to North through Central Paris. 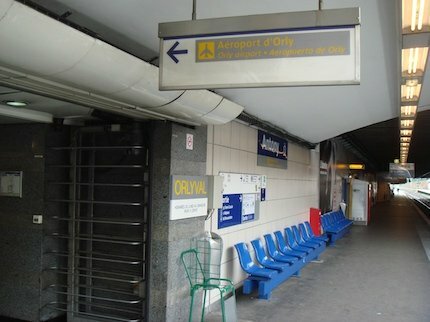 To find the OrlyVal train station entrance at Orly Airport, look for signs reading ORLYVAL (some signs may also show “Airport Shuttle”). Below is a photo of the Orly West terminal OrlyVal train entrance. (The big Christmas ornaments are there only during the holidays). 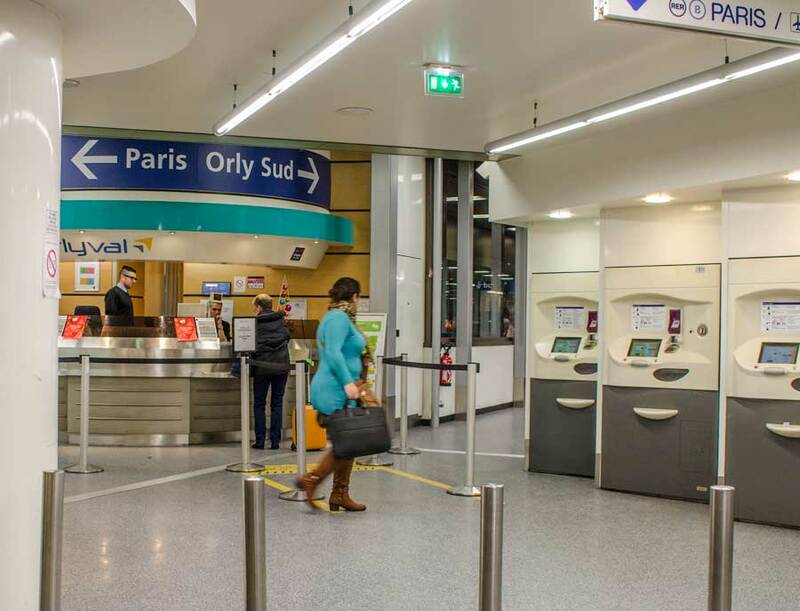 The ticket machines at the OrlyVal ticket office take Euro coins, credit and debit cards using chip + PIN technology. To purchase Orly train tickets in Euro cash, use the OrlyVal ticket booth visible on the left of the photo below staffed by vendors who will help you (or you can try to find the OrlyVal ticket vending machines that take cash, a few do, see second photo below). Although you could potentially purchase a Navigo card from the ticket booth, the Navigo passes are not valid on the OrlyVal train. OrlyVal is a short shuttle train owned & operated by a third party that is not part of Paris city transportation group (known as the RATP). For whatever reason the company operating OrlyVal do not have an agreement with RATP to allow RATP transit passes to work on OrlyVal. 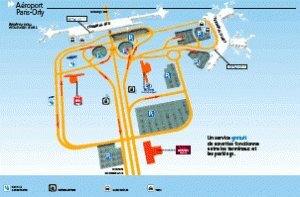 Thus the only pass valid for OrlyVal is Paris Visite ticket and only the 5 Zone (Paris Visite is also available in a 3 Zone version, but Orly Airport is in Zone 4). A few of the OrlyVal ticket machines at Orly Airport train station accept Euro cash notes for buying train tickets & passes. The train ticket vending machine photo below shows a cash slot at the far bottom right, showing the various bill denominations accepted (5, 10, 20, 50, 100 Euro notes). The Euro cash note / denomination the ticket vending machine will accept depends on the total purchase price of train tickets or train passes you are buying. 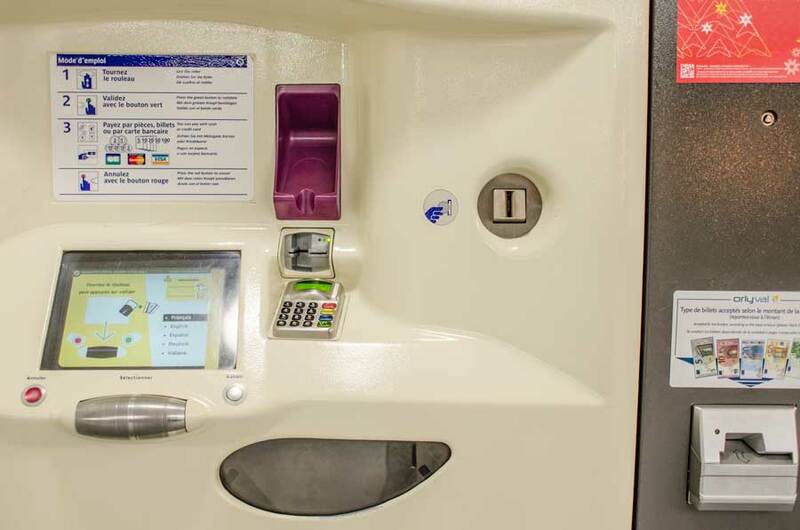 The higher your total train ticket purchase, the larger the cash note you may use in the ticket vending machine. Change will be given, but only in Euro coins, arriving by the same slot your tickets will be dispensed into: the large central slot at the bottom. The OrlyVal train towards RER B Paris city train line is quick & short, only one stop from Orly West (Ouest) and two stops from Orly South (Sud) to Antony station. A change of trains is required once you arrive at the OrlyVal terminus (last) station: Antony. From Antony station, take the RER B train line in the direction of Mitry-Claye, Aéroport Charles de Gaulle, which passes through central Paris stations Luxembourg (Jardin du Luxembourg), Saint Michel Notre Dame, Chatelet Les Halles, and finally Gare du Nord before leaving central Paris and continuing onto Aéroport Charles de Gaulle in Roissy. Travel time on OrlyVal + RER B train between Orly South and central Paris (station Chatelet Les Halles) is at longest 40 minutes, station to station, including changing trains at Antony. The travel time from Orly South to Antony is 8 minutes. If you’re leaving from Orly West, travel time to Antony is 6 minutes. From Antony to Chatelet Les Halles station in Paris along RER B train line travel time is 25 minutes. Keep in mind that the Pass Navigo Découverte for Paris is not valid for the OrlyVal train. If you have a Pass Navigo with at least 4 zones purchased, it would be best to purchase a single ticket for the OrlyVal train just to Antony at a cost of and from there use your Passe Navigo for the RER B line to Paris. A single ticket (a billet Ile-de-France) for the entire journey between Orly and central Paris will cost (adult) and (children). The cheaper option, avoiding the OrlyVal train fee altogether, would be to take the RER C line from Gare d’Austerlitz towards Massy Palaiseau getting off at station Pont de Rungis – Aeroport d’Orly and then taking the Aeroport de Paris shuttles to the Orly terminals. To see all travel options, prices and travel times between Orly and Paris, see Transportation between Paris and Orly Airport.